Save the Date…December 4, 2014, FAB studio Gallery Presents “Environmentalism-O” Featuring the Art of Javier de Aubeyzon! FAB studio GALLERY is pleased to present the Los Angeles opening of “Environmentalism-O,” a solo painting exhibition by Argentina-based environmental artist Javier de Aubeyzon on Thursday, December 4, 2014 at FAB studio GALLERY in Santa Monica. Enjoy a conversation with lowres-Dec4-2014-FABstudio-Javier-DeAubeyzonthe artist on Saturday, December 6, 2014 from 5pm to 6:30pm. See below for RSVP info for this event. 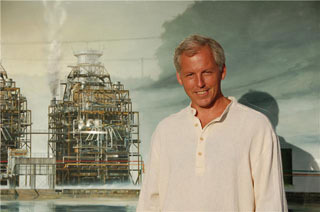 Environmentalism-O is the West Coast American debut of Javier de Aubeyzon, a well-known Argentinian environmental artist and architect. Through painting, Javier explores the push-pull of man’s relationship with nature and the environment. This can range from awe over nature’s raw beauty, as seen in his “Natural Environmental Landscapes” series of oil paintings where he depicts anything from icebergs to a breathtaking view of the earth with the sun reflecting off its surface. In the “Natural Environmental Landscapes” series he examines what’s at stake when we talk about the environment and global warming; this can be anything from marine life to glaciers, two casualties of climate change. Javier is from Argentina which contains Ushuaia, the capital of Tierra del Fuego, the Southernmost city in the world and one of the coldest. 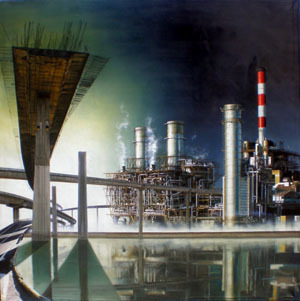 Javier also has a series called “Urban Industrial Landscapes.” Here he might show a marvel of civilization, such as a seaside industrial landscape containing a hydropower plant, an expression of man harnessing nature for his own benefit. The rate of change is dangerous. Javier depicts the technological advance as one that is sinister and some of his paintings have a post-apocalyptic feel. He also often depicts the trash and detritus of society, consumption and obsolescence. Sponsors: Ushuaia Argentine Restaurant and Terrazas de los Andes Wines will provide passed hors d’oeuvres and wine. This is a “leave-no-trace” environmentally concerned event and guests should bring their own wine glass to the opening. You must RSVP for the artist talk (Sat Dec 6, 5-6:30pm) at gallery@FABstudioLA.com or at (424) 744-8156. © 2012 Kathy Leonardo. All Rights Reserved.